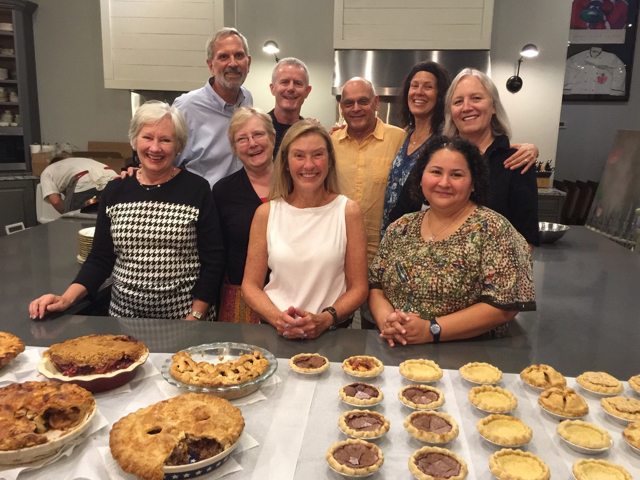 A week ago today, a diverse group of Pie Academy members, including myself and my wife Bev, gathered in Charleston, South Carolina to take part in our 4th annual Lowcountry Pie Getaway. As always, I approached the weekend with a mix of excitement and concern. 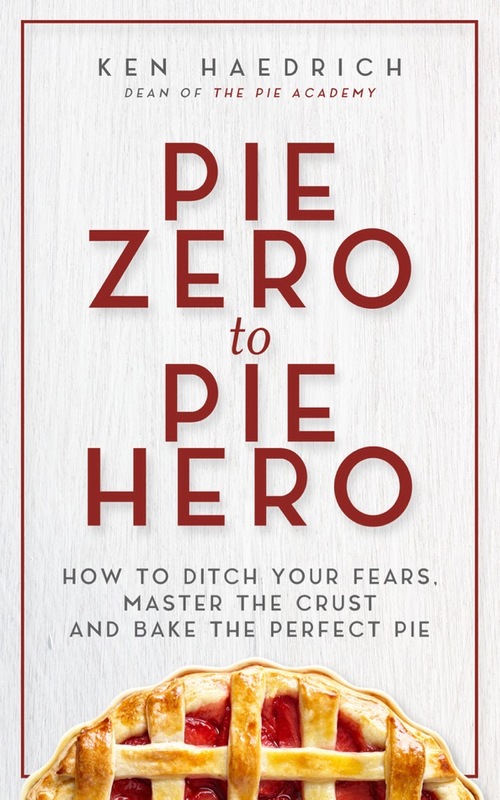 I love everything about the weekend, but this is our signature event at The Pie Academy and, being something of a worrier, I like to sweat all the stuff, big and small. Will everyone enjoy making the mini pies as much as I hope they will? Is the breakfast menu varied enough? 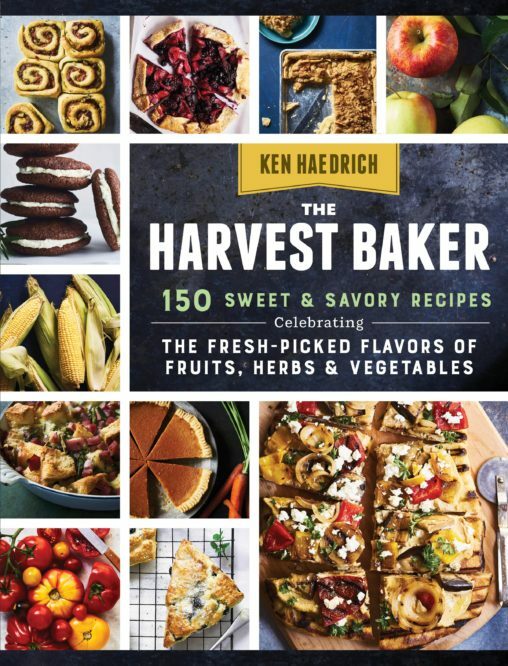 Have I planned to cover enough ground with my pie curriculum? Or perhaps I’m hoping to accomplish too much. Would Jason, our guest chef for Sunday’s send off dinner, arrive on time? As is often the case, all my worry was for naught. Our attendees from across the country could not have been more terrific or shown greater spirit and enthusiasm. 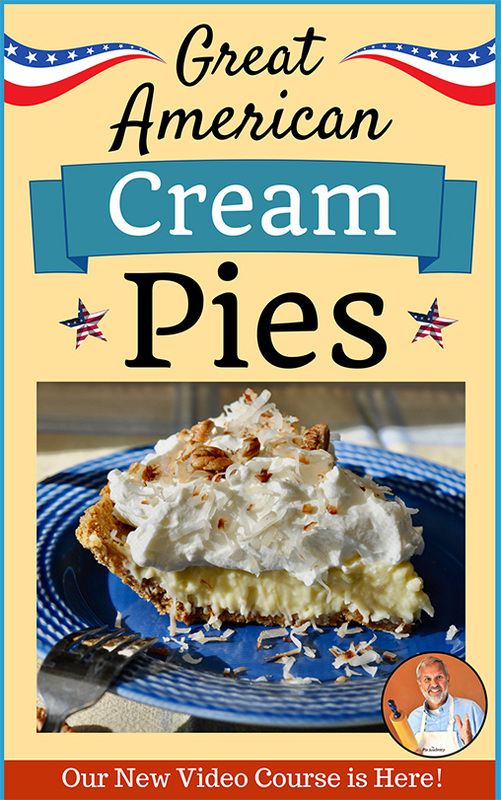 Their facility with pie crust, even those with limited pie making experience, was truly impressive. It was a joy to spend a solid weekend with each and every one of them, becoming friends and baking our way through pies both sweet and savory. We began the weekend as in years past with our Friday night reception, a wine and apps icebreaker where we get to meet our attendees, their non-participating spouses and companions – designated tasters, as we call them – show off our gorgeous studio kitchen and hand out the highly anticipated swag bags you see pictured here. Bev is the creative force and acquisitions director behind these gifts and they’re just one of many Getaway details where a woman’s touch makes a huge difference. Left to my own devices, I’d probably just pile everything into brown paper lunch bags and call it a day. On Saturday morning we dove right into pie dough, making several with both the food processor and by hand. 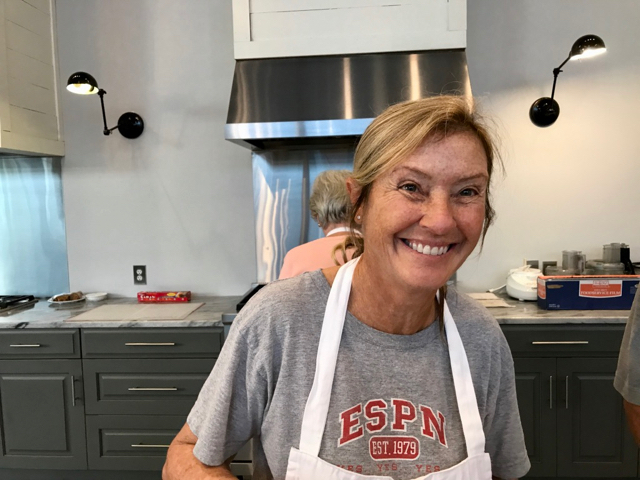 I always tell myself that if I accomplish nothing else during the Getaway, I want to instill unshakable confidence in each of our participants when it comes to mixing and handling pie dough. Convenient as it is, many home bakers haven’t taken to making pie dough in the processor, so this is an opportunity to demonstrate just how simple it is. 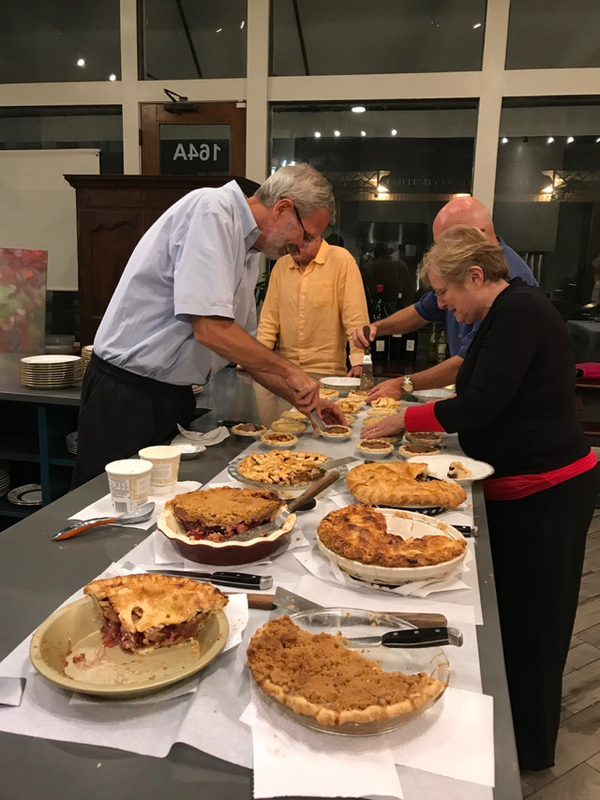 Using our Create-an-Apple-Pie Template, each attendee prepares a fall fruit pie of their own design. Here’s Jim – a returning graduate from the 2016 Getaway – weaving a gorgeous lattice top. I’ve stayed in close touch with Jim over the past year and I can report that he’s become a real pie making powerhouse. 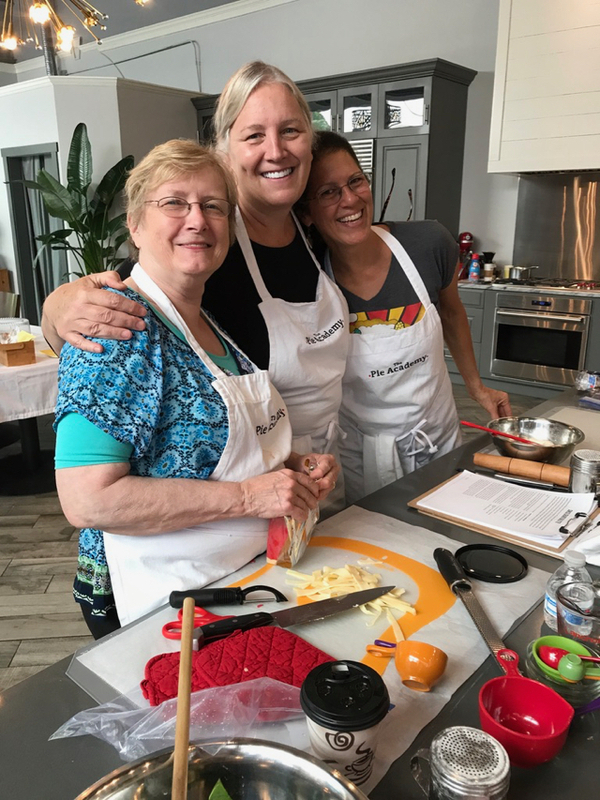 These photos – that’s Helen, Heidi and Robin above, and Rachel below – were taken on Sunday morning, while the class members prepared the fillings for their savory pastries. We bake in two-person teams on Sunday and the challenge is to get your quiche, galette, or savory pie into the oven without delay so there’s something good to eat by lunchtime. If there’s any pressure involved, you wouldn’t know it from the smiling faces here. Those things that look like shards of cheese shaved off a block of it with an apple peeler are precisely that, owing to the fact that our cheese grater took the weekend off. Toni (below) like Jim, is another Getaway graduate who returned for this year’s event. We love it when our attendees come back for another Getaway. I’d like to take all the credit for our high return rate, and tell you that we put on such a bang-up event that folks can’t stay away. But the truth is the other fine attendees have as much to do with this phenomenon as we do. They go home with one another’s email addresses and phone numbers, stay in touch over the year, and look forward to rekindling their ties at the Getaway. This sense of community is one of the best things about our Getaways. By Sunday evening we were ready to relax and let someone else do the cooking. 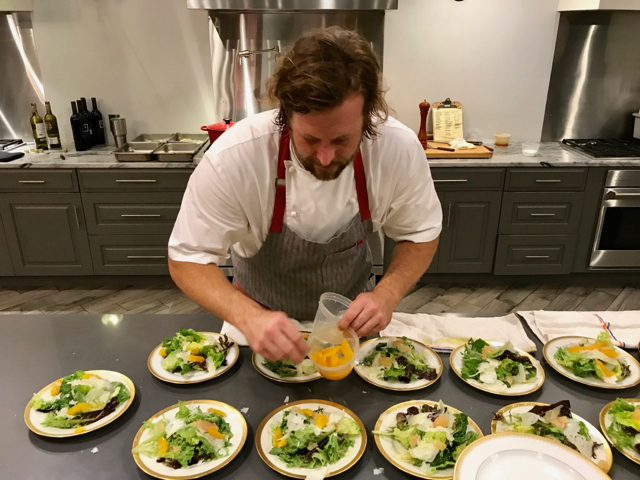 For the second straight year we left that responsibility to one of Charleston’s celebrated cooks, Chef Jason Houser. 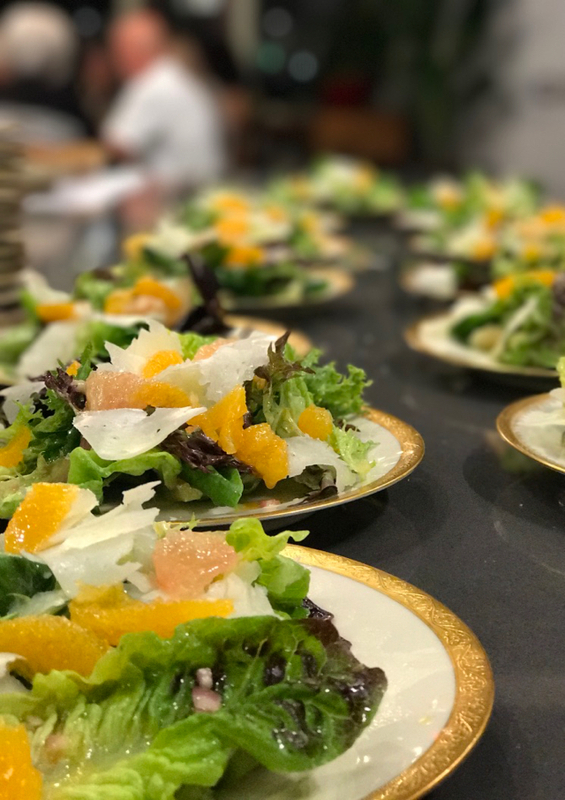 His dinner of citrus salad, braised beef ribs bourguignon, and seafood mac and cheese was one of the best meals I’ve eaten in Charleston, or anywhere else for that matter. 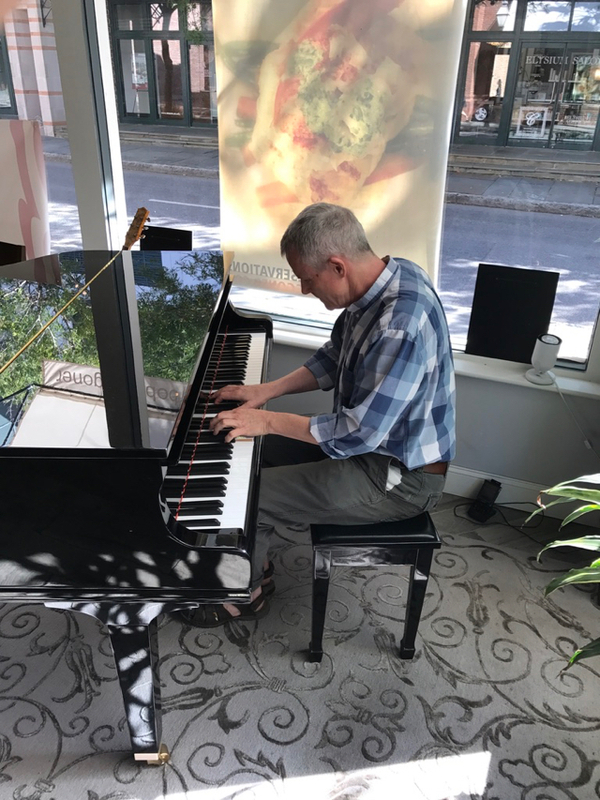 Our large kitchen facility in Charleston is home to a lovely grand piano, which – under normal circumstances – would be good for little more than a few annoying renditions of chopsticks. But this was no normal year. 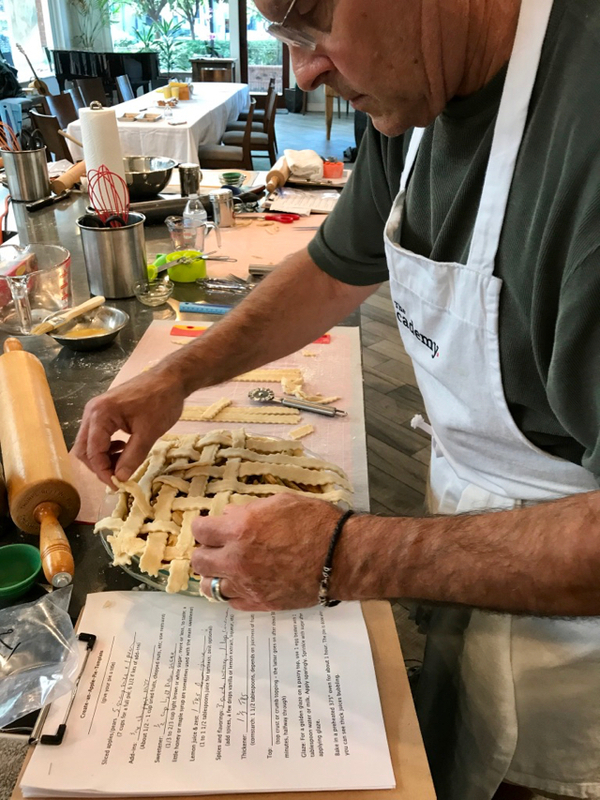 Bob, one of our pie makers, had a hidden talent suited to our reception and send off dinner: he’s a professional pianist who travels with Broadway shows, among other gigs. Many thanks to Bob for making some great music for us this year. Even after Chef Jason’s meal we all found room for a little more at Sunday evening’s Pie & Ice Cream Social. 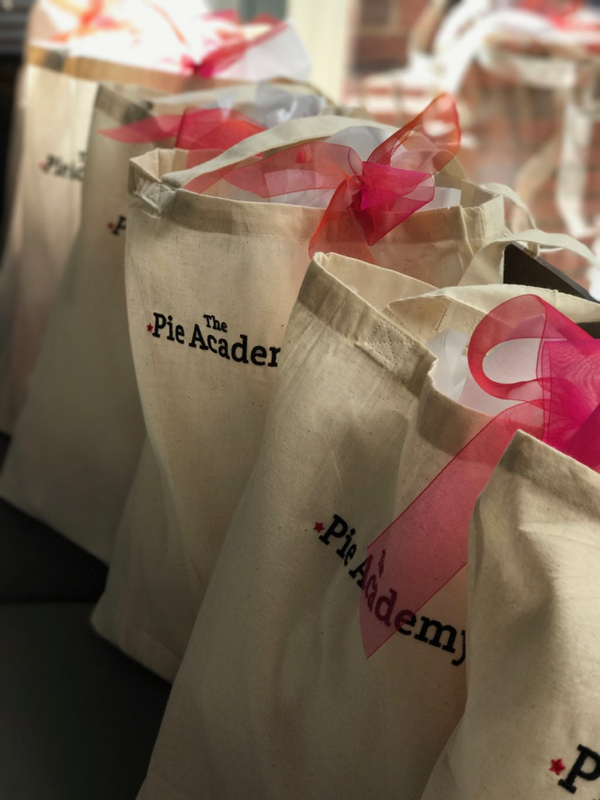 What we didn’t eat then was divvied up and sent off with our attendees, foil-wrapped pouches of pie jetting home to Utah, Texas, Illinois and points distant along with diplomas and a swag bags full of gifts and memories. There was plenty of pie for Paul, our hard working kitchen assistant, too. We were sad to say goodbye; our Getaway always feels like a too-short family reunion. 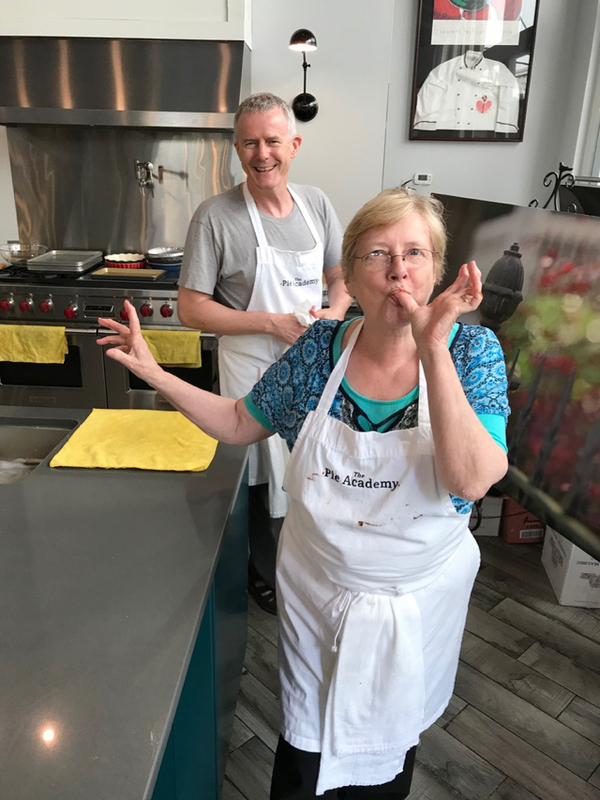 But everyone was anxious to get back home, unpack their newly acquired pie skills and put them into practice in their own kitchen. Thanks to all of our awesome attendees who made this year’s Lowcountry Pie Getaway so memorable. We appreciate your support, your smiles, and your contributions to a fabulous weekend. NOTE: Did you miss this year’s Getaway, but want to get in on the next one? Send us an email and let us know. 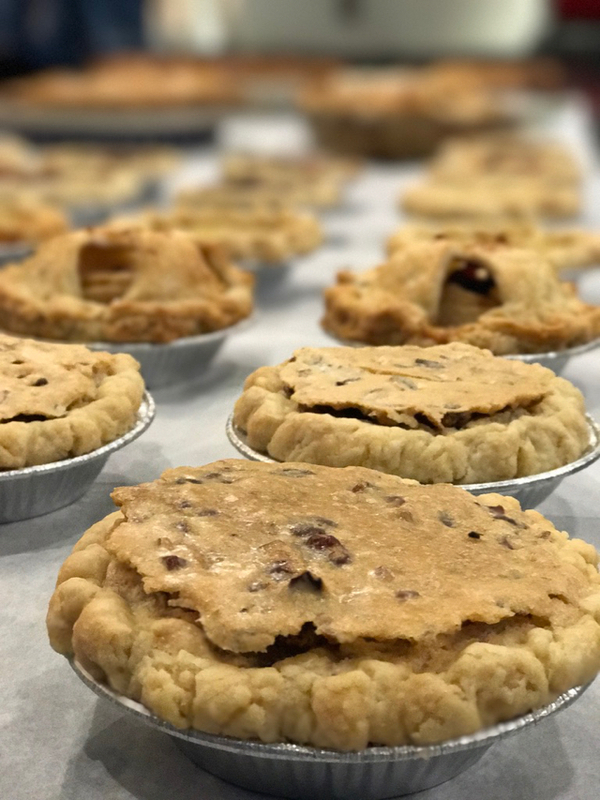 We’ll make sure you get early details about the 2018 Lowcountry Pie Getaway as soon as we have them. 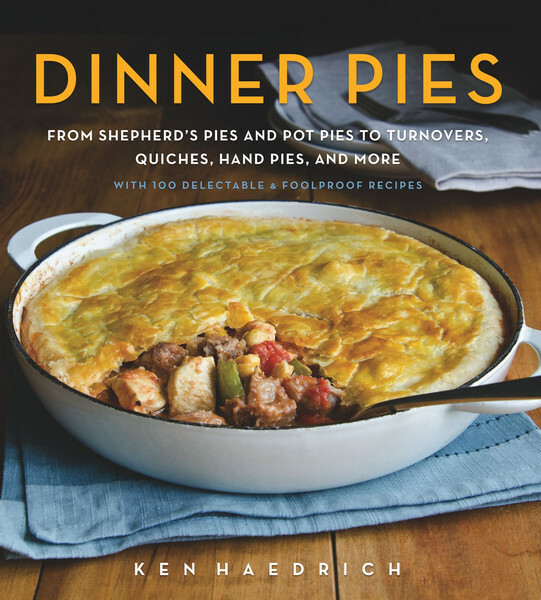 Can’t wait until then to hone your pie skills? Then let me suggest signing up for our No-More-Tears Pie Pastry Course. 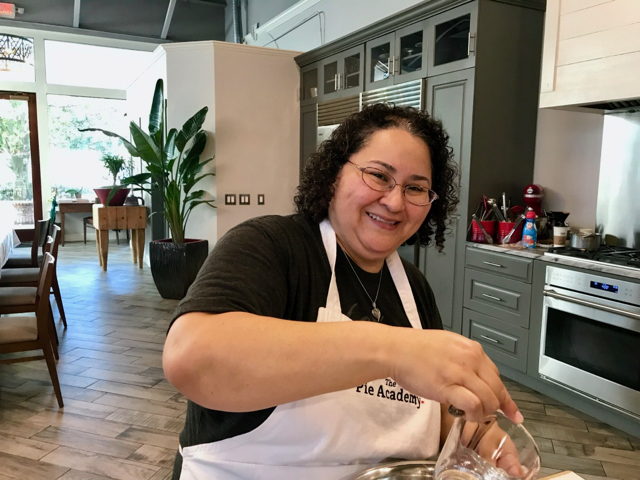 Our premier video course has helped hundreds of pie makers ditch their fears and learn the skills needed to make beautiful pies at home. Click the banner below to read all about it.